Posted in: Crime Stoppers, Media Release, Put A Name with This Face, Reward, WANTED. Tagged: Johnson. 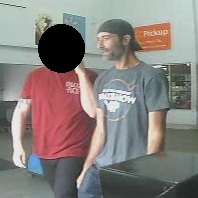 Franklin Police are asking for help from the public to identify two suspects wanted after fleeing from store security during their attempted theft of nearly $500 in movie DVDs. It happened at the Mallory Lane Walmart on May 27. The suspects got away, empty-handed, in a green GMC Denali. If you know who they are, you could earn a cash reward of up to $1,000 with an anonymous call to Crime Stoppers: (615) 794-4000.